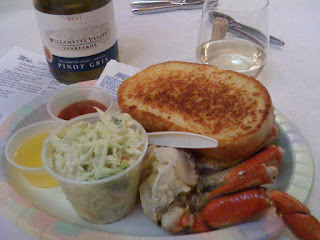 This weekend was the annual Mo's Crab and Chowder Festival at Willamette Valley Vineyards. A few year ago this was one of the first events that I went to at WVV, and had such a good time that I have made it a point to go every year. Crab and wine, who could ask for a better combination? We arrived around Noon on Saturday, and despite only being open for an hour the place was pretty much packed already. Luckily Micheal had squirreled away a table for us in a secret hiding space that I won't disclose, and our group was quite comfy. I promptly got one of my very favorite seafood wines, the 2007 Willamette Valley Vineyards Pinot Gris, a Wine Enthusiast Best Buy wine with a 90 rating. This wine is very drinkable, with a crisp taste and a nice fruit basket on the nose. At $16 a bottle, its perfect to keep a few bottles around. Mo's was serving up chilled dungeness crab by the half or whole, with coleslaw, cheesy garlic bread, and the options on clam chowder and shrimp skewers. Their clam chowder may be famous, but I'm a crab guy through and through. In other excellent wine news, researchers at Oregon State University (disclosure...they pay my salary) have developed an earthquake-proof wine rack in partnership with the Wood Innovation Center. This rack has survived simulated earthquakes of magnitute of 7.1 and is designed primarily for the retail environment. I should think this will become a popular mainstay in California wine country. Finally, I leave you with good news in the world of Washington wine categorization. One of the initial grape growing regions in the state has gained recognition from the feds as an American Viticultural Area (AVA) -- Snipes Mountain. Located in the Yakima Valley near Sunnyside, this appellation is one of the smallest in WA that's climate is ideal for Syrah and Cabernet Sauvignon. As an AVA, winegrowers and makers from the area can further distinguish their wine as unique. Sounds like a good time!! I'm going to be in the area at the end of Feb-is there anything cool happening around that time?